Symbols*: Dolphins are highly intelligent creatures. They surface to breathe the air, which represents the intellect, and plunge back into the emotional qualities of the aquatic bodies below. Their keen senses and ability to engage in echolocation give us the impression that they possess psychic qualities. The dolphins swim through vital, rippling waters. Cups encircle their movements but the active creatures fail to investigate the gifts that the contents could provide. Their direction seems aimless as they swim above a fragmented-looking surface that offers no indication of their whereabouts. 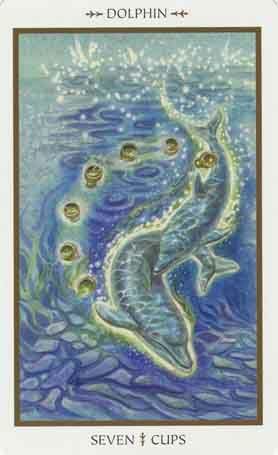 Instead of utilizing the energy for creative purposes, the dolphins swim haphazardly in chaotic waters. Description*: Too many ideas and projects can overwhelm the psyche and lead to disorganization and unproductivity. If we do not develop a thorough plan on how to achieve our goals, we can succumb to feelings of depression and self-admonishments that could have disastrous consequences. It is important to be sensible with out choices and commitments. Engage in creative activity that is nurturing, not depleting. Possible Meaning: Too many ideas and projects can overwhelm the psyche and lead to disorganization and unproductivity. Dolphin reminds us to listen more and talk less. Through listening to someone while they talk, you can "hear" the tones of the voice, not just the words. Also, listen when you are outdoors - listen to the heartbeat of Mother Earth, to the sound of the birds. Listen to the trees talking as a breeze rustles their leaves. Sound is creative life force. Dolphins always seem to be smiling - take a clue from them and smile more often. They can also be creative force. Thoughts/Points to Ponder: To me personally, dolphins have always been a part of my life. I’ve always been drawn to them, for one reason or another. I wish to one day work with dolphins. Like usually, these dolphins are smiling. Dolphins are very intelligent creatures, and they should be treated gently, with tender love and care. I see a mother and a child in this image, they have just finished jumping. They’re content and happy. What do the auras around them mean? One of the rocks (below left) looks like a bird. Why? Dolphin reminds us to listen more and talk less. Through listening to someone while they talk, you can "hear" the tones of the voice, not just the words. Also, listen when you are outdoors - listen to the heartbeat of Mother Earth, to the sound of the birds. Listen to the trees talking as a breeze rustles their leaves. Sound is creative life force. Learn from nature and Dolphin how to create inner sounds so that you can create outer manifestations. A Dolphin totem can show you how to enter the waters of life and then with breath and sound call forth what you most need or desire. Sounds are a part of dolphin life, and therefore, if you have this totem, they need to be a part of yours. Dolphins always seem to be smiling - take a clue from them and smile more often. Be more loving and kind towards people and they will return the same. Dolphins are also one of three sentient beings here on Earth (humans and Whales are the other two) and we are just now beginning to understand their complex language.